U.S. Stock futures are heating up Monday on greater optimism about European leaders coming closer to finding a unified solution to solving the debt crisis. NEW YORK (TheStreet) -- U.S. Stock futures were heating up Monday on greater optimism about European leaders coming closer to finding a unified solution to solving the debt crisis. Futures for the Dow Jones Industrial Average were gaining 133 points, or 125.5 points above fair value, at 12,133. Futures for the S&P 500 were up 15.7 points, or 15.7 points above fair value, at 1259. Futures for the Nasdaq were rising 28.7 points, or 29.9 points above fair value, at 2332. Stocks failed on Friday to hold onto gains stemming from a strong read on the U.S. jobs market as reemerging European debt fears put a damper on sentiment. German Chancellor Angela Merkel and French President Nicolas Sarkozy are meeting in Paris on Monday to outline plans for eurozone nations to achieve stronger fiscal integration and budget alignment ahead of the European Union summit this Friday. Over the weekend, the new Italian prime minister Mario Monti said his government has approved a package of budget cuts worth 30 billion euros, or $40 billion, to prevent the country from toppling into bankruptcy. The leader will present the plan on Monday to lawmakers, who are expected to vote on it in late December. Germany's DAX was rising 0.5%, and London's FTSE was up 0.58%. Japan's Nikkei Average settled 0.6% higher, and Hong Kong's Hang Seng Index closed up 0.73%. 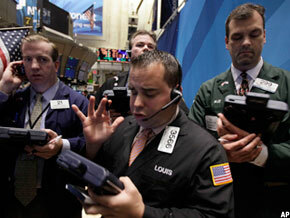 Stock gains were being held back by poor economic data in Europe's largest economy and Asia's economic powerhouse. Germany's private sector contracted in November for the first time in more than two years, with Markit Economics reporting that its Purchasing Managers' Index for the country dipped to 49.4 from 50.3 in November. Meanwhile, China's services sector in November slowed to its weakest pace in three months, according to the HSBC purchasing managers' index. The index fell to 52.5, from 54.1 in October. In corporate news, SAP ( SAP plans to buy SuccessFactors ( SFSF, which provides cloud-based employee-management applications, for $3.37 billion. SAP, the German enterprise applications software giant, will pay $40 in cash for each share, a 52% premium to SuccessFactors' closing price Friday of $26.25. SuccessFactors shares were rising 52.4% to $40 in premarket trading Monday. SAP fell 1.6% to $58.59. Commercial Metals ( CMC rejected a buyout bid of $15 a share, or $1.7 billion, from investor Carl Icahn. The bid undervalues the metals recycler and is "opportunistic," said Commercial Metals' lead director Anthony Massaro in a press statement Monday. Icahn had set a deadline of Monday for Commercial Metals to respond to his proposal. Shares of Commercial Metals closed Friday at $13.90. Dollar General ( DG, the discount retailer, earned 50 cents a share in the third quarter on revenue of $3.6 billion. Analysts were expecting profit of 47 cents a share on revenue of $3.57 billion. Entergy ( ETR sad Monday it plans to divest and merge its electric transmission business with ITC Holdings ( ITC. Entergy is to get $1.78 billion under the deal, which is expected to close in 2013. U.S. factory orders for October and the Institute for Supply Management's non-manufacturing services index for November will be released at 10 am ET Monday. Factory orders, to be reported by the U.S. Census Bureau, likely fell 0.3% in October, after increasing 0.3% in September, while the ISM services index likely rose to 53.5 from 52.9 registered in October, according to a survey of economists by Thomson Reuters. January oil futures were up 45 cents to $101.41 a barrel, and February gold futures were falling $9.50 to $1,741.80 an ounce. The benchmark 10-year Treasury was falling 15/32, raising the yielding to 2.088%, and the U.S. dollar was down against a basket of major currencies, behind by 0.2%.